Ironically, even spelling the word “awkward” is, well, awkward. It’s just one of the small annoyingly awkward things that we’ve all faced at some point in time—usually multiple times throughout a day. They’re unavoidable. They’re consistently awkward. They’re part of everyday life. 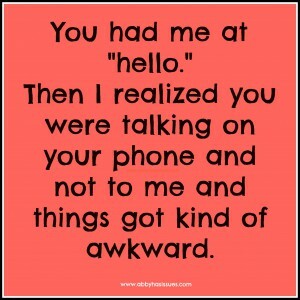 And fortunately—unfortunately?—we can all relate…awkwardly. Bumping into someone at thegrocery storeand saying goodbye, only to see them in every single aisle after that. Passing a slow driver and then getting stuck next to them at a red light where you have to pretend to busy yourself and avoid awkward eye contact. When someone catches you accidentally staring at them…twice. Watching a movie rated anything above PG with people you’re not that familiar with and having a steamy scene last a little too long.